The Smok TF-RTA is what everyone has been asking for in regards to improving the TFV4. Yes, the TFV4 does have RBA options such as the TF-R1 and the TF-R2, but they compete to an actual tank that is specifically designed to be an RTA. The TF-RTA is nicknamed the “BEAST TAMER” due to the insane quality of vapor and cloud production that is possible from this beast. 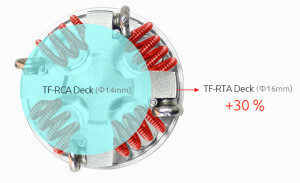 The TF-RTA is a 24.5mm tank that has an e-liquid capacity of 4.5ml. 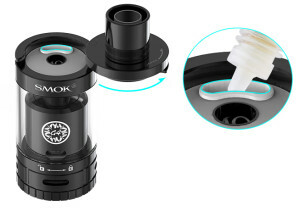 The tank aesthetically looks very close to the original TFV4 by Smok, but it also includes a new hidden sealing ring and a new innovative liquid control system. There is a liquid control ring that will allow you to seal off any liquid from coming out when taking out your deck to build a new coil or replace your cotton. 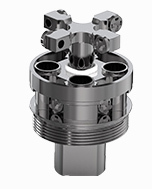 This RTA is top filling and it uses the same style swivel top that the TF4 did. You can easily slide the swivle top to the side and fill your RTA with e-liquid through the filling hole. The stainless steel drip tip that comes with the Smok TF-RTA has a inner heat shield to prevent your drip tip from getting too hot. The drip tip also features a glass inner tube that helps prevent e-liquid spitback. The G4 is optimized for quad coil builds, has four posts, and a 16mm deck. The G4 comes with a pre-installed 0.14ohm coil.